Egg donation is the process by which a woman, who is usually younger, provides eggs to another person and/or partner for purposes of assisted reproduction so that the recipient of the eggs can have a baby with partner or donor sperm. 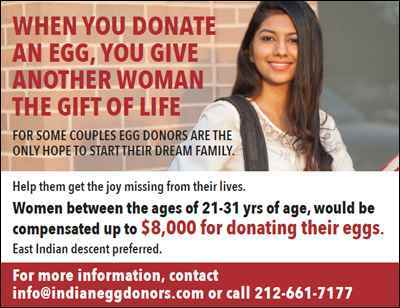 Indian Egg Donors has been helping women to conceive using donated eggs. Our NYC area donor egg program meets the highest standards and criteria set by the American Society for Reproductive Medicine. Egg donation is a special and generous gift. There is some financial compensation, but the primary benefit is the great satisfaction of helping a couple have a baby. The first step toward egg donation is understanding the process. We hope this information will help you decide whether you would like to be an egg donor for our program. If you would like more information about how to become an egg donor in NY, please contact our Donor Program Coordinator at (212) 661-7177.